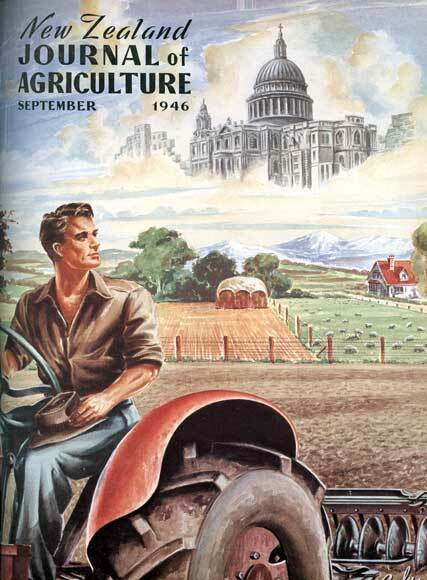 In 1946 New Zealand farmers may well have been thinking of Britain (represented here by a London skyline with St Paul’s Cathedral prominent) while preparing a paddock with tractor and rotary hoe. The Second World War was just over and many men were recently demobilised after fighting in Europe. New Zealand was still strongly focused on supplying food to Britain, where rationing remained in place. But the illustration could have been used any time in the previous half-century with equal validity: New Zealand was seen as Britain’s South Pacific farm. Reference: New Zealand Journal of Agriculture. September 1946.